The Confederations Cup is well underway, with 3 games already having been played in Brazil, as national teams of the finest calibre cross blades. Italy, Spain, Uruguay and Brazil clash and we have therefore put together an awesome and interactive campaign-site, where you can see all the shirts, balls and much more. Check it out right here. Confederations Cup 2013 will be a warm-up and test of strength ahead of the World Cup in 2014, which will also take place in Brazil. The tournament is played between the teams, who have won their respective association cups, which means we will see the following eight teams in action: Brazil, Spain, Italy, Uruguay, Mexico, Japan, Nigeria and Tahiti. There are plenty of massive profiles from all the teams, except the last maybe, but it is always good with a wildcard in the pack. 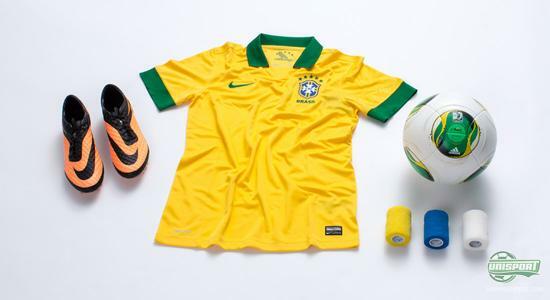 You can get close to the Confederations Cup 2013; see the shirts, matchball and much more by clicking right here. It has been a great weekend of football with Brazil clashing with Japan in the opening match of the 2013 Confederations Cup. Mexico took on Italy yesterday evening, as well as Spain besting Uruguay late yesterday night. All in all a great set-up, but if you are also interested in the equipment, you can learn all about it here with us. We have gathered all the newest boots and shirts from the tournament on a smart, interactive campaign-site, which you can find right here. You will struggle to watch every single Confederations Cup game, but if you did watch the Spain game against Uruguay you would have not only witnessed top class football, but also spectacular kits too. If you, just like us, can't decide which one of the two is the coolest, you can find out more about them right here. You can also read more about the CAFUSA-ball, Premier Sock Tape and much, much more. Everything and more can be found on our Confederations Cup 2013 campaign-site here. It is a mini tournament and there really is nothing better than sun, summer and good football. Which team do you think will come up trumps in the Confederations Cup? And which team has the coolest shirt? Share your thoughts in the box down below, or on Twitter and Facebook.